some more character exploration for Project Teiresias, looking for interesting silhouettes and shapes. Stay tuned for more Teiresias stuff! Hey, I was gonna leave a comment here yesterday but then I got distracted by some distraction. Very cool stuff, Kat! If I was the director I'd say go with the second one from the left on the bottom row (but only if he could have the stick of the guy above him) Staying tuned! Hi Tobes, I'm glad you like them. 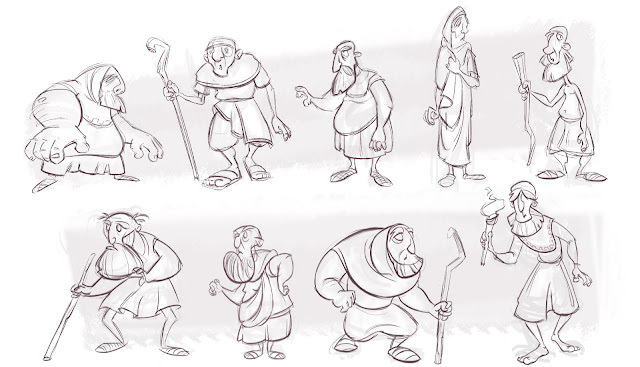 I like that one too but he kind of looks like a grumpy old dwarf and not Teiresias :P I might go for the one on the top or the last one from the right on the bottom row..